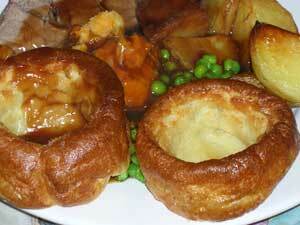 A great Yorkshire Pudding recipe . . . This week's column and recipe covers Yorkshire puddings, Yorkshire pudding recipes and how to cook them at home which many people seem to have a problem with. Yorkshire pudding is the quintessential of English side dishes for roast beef. Though if you are like my family it is served with every Sunday roast whether its beef, pork, chicken or lamb. Where did this dish originate and why? Well the name suggests of course Yorkshire but other counties in the UK make claim to its origin also. I have always been told that originally it was not actually served with the roast beef but before the meal itself, drenched in a rich gravy. Apparently, it was created to be served as a stomach filler. Times being hard and meat an expensive item in most working class family budgets, as such the traditional Sunday roast in the UK being quite an event and something to look forward to each week. With a generous amount of beef flavoured gravy, the Yorkshire pudding not only tasted like beef, it had a texture similar to it and cheaply filled the stomach . . . meaning the small portion of beef actually served did not seem as meagre as it might have actually been. Any that were left over would be served for afternoon tea with jam, cream, etc and why not, they are just a form of cake after all! 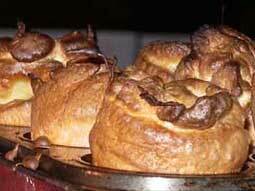 For other ideas on Yorkshire puddings with a difference, see my Chef Notes after the recipe. These days of course we serve it as an accompaniment to the roast beef and gravy, along with the traditional roast potatoes, vegetables, etc. Creamed horseradish of course also being a must. Thanks for the Yorkshire Pudding recipe. I tried it and they were superb!!!! What about the problems many people have making them like why do they not rise? Why do they fall flat? Should they be crisp or soft? The latter for me is a totally personal issue, some like them soft, some crisp on the outside and soft in the middle. When you lash them with a gravy does it make any real difference? But to answer the main problems people have with them, rising and falling flat. One must think and understand about why and how this happens to answer it. They rise mainly because of the egg content in the mixture. NEVER add baking powder! For the rising to occur the mixture needs instant heat, this creates steam and they puff up and rise - so the oven and the pan must all be pre-heated. A slow gentle heat or cold oven will not work. They will fall flat if they are removed from the oven too soon. If they do not slightly crispen on the outside the structure of the egg and flour mixture does not fully dextrinise, meaning its structure will not hold its own weight . . . think of building a sky scraper out of wood, eventually it will buckle and collapse under its own weight. Cooking times will always vary, as everyone's oven is slightly different and because we tend to open and close the door to remove the meat, the potatoes, etc. So the 12 minutes I have given here is approximate only, you will need to judge and modify accordingly. To get a good rise one must fill the mix with as much egg as possible using only a drizzle of milk. Unfortunately the recipe here then is not 'foolproof' in amounts, as I cannot guarantee the size of eggs that you use and they do differ in amount by as much as 20gm per egg, so it is best to adjust the flour rather than the egg. The trick is to pack the mixture with eggs! All very long winded I know, but so is the life of a professional chef or home cook who seeks perfection. I would be most interested to hear from you all on how you grt on when you try this recipe. So get those fingers tapping on the keyboard and please email me and let me know! Place the muffin tray / moulds in the oven to pre-heat (180° to 200°C) for 15 minutes. The oil may also be added at this time and heated in the oven or may be heated separately and poured in. I find that putting in enough oil to 1/5th of the mould works best. And you thought Yorkshire Puddings could only be used for roast beef! Enjoy your Yorkshire Pudding and bon appetit . . . . .